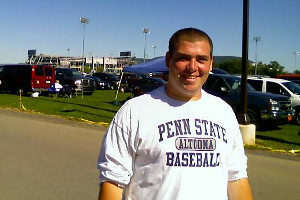 Alex Reed was a perfectly healthy senior at Pennsylvania State University. He was an active baseball player, had plenty of friends, and was looking forward to graduating in May. During winter break, he came down with a high fever accompanied by high blood pressure. He was admitted to the emergency department, but due to his age and otherwise healthy disposition, he was diagnosed with the flu, given a blood pressure pill, and sent home. With that episode behind them, Alex went back to school, finished the spring baseball season, and graduated. Things started to go downhill not long after. He became lethargic, had an upset stomach, and looked terrible. His blood pressure had skyrocketed again. He was hospitalized for two weeks in the intensive care unit. “The hospital had difficulty controlling his blood pressure,” Bobbie explained. “But they finally had success with four different blood pressure medicines.” As he stabilized, Alex was moved to a regular patient room, where they began diagnostic testing. They looked at his kidneys and did a few ultrasounds. Despite numerous follow-up appointments and assurances throughout the summer, Alex wasn’t improving. He was taking blood pressure medications every day. As summer turned to fall, he and his mother received a call. His kidney function had never recovered, and both of his kidneys were destroyed and failing. He was in end stage renal failure. Alex was 23, a new college graduate, and he needed a kidney transplant. “It was the first time someone talked to us about kidney disease,” explained Bobbie. “No one, at any point, had spoken to us about diet or what precautions we should’ve been taking. All that time, there were things we could’ve been doing to preserve his kidneys.” They were referred to a vascular surgeon and surgery was done to place a fistula in Alex’s arm in preparation for hemodialysis. It would take several months for the fistula to be sturdy enough to withstand the treatment and several weeks for Alex to be trained for home hemodialysis. “He was visiting the nephrologist every couple of days. Kidney disease is usually a slow degrading disease, but Alex was the exception,” Bobbie explained. By early December, he couldn’t sleep lying down without choking, so he had to sleep sitting up. His physical condition was deteriorating and he wasn’t scheduled to start dialysis training for another few weeks. His parents followed up with the vascular surgeon, who realized that Alex was crashing. He was sent to the hospital a few hours later, and they conducted emergency surgery to place a neck/chest catheter to initiate dialysis immediately. It took more than six months to get on the transplant list as the doctors searched for the reason for Alex’s sudden kidney failure. After Alex was accepted onto the transplant waitlist, his parents aggressively worked day and night to find a donor. They found success with a fellow alumnus of Penn State, who went through the preparations and procedures to be a living donor—including losing 30 pounds. A little more than two years after Alex was diagnosed with end stage renal failure, he had a new kidney. Nowadays, Alex is on anti-rejection medication and works in his parents’ office when he’s feeling up to it. His mother is an advocate for kidney patients and donors’ rights, and encourages patients to push their doctors for more information. She is active with the National Kidney Foundation (NKF)’s Kidney Advocacy Committee, as well as the American Association of Kidney Patients, which spearhead initiatives through advocacy on legislative issues, community involvement, and help people navigate kidney disease. She has convinced congressional representatives to co-sponsor the Living Donor Protection Act, which will afford organ donors protections from losing their jobs, prevent discrimination when seeking health and life insurance, and allow them to receive benefits under the Family and Medical Leave Act. She has spoken about her experience caregiving through Alex’s diagnostic journey and is a patient ambassador with the Patient Centered Outcomes Research Institute. She helped write ‘The Big Ask, The Big Give’ NKF program, which educates kidney patients and their caregivers about how to find living donors. “If the hospital had taken his first blood pressure incident seriously and not dismissed it due to his age and fitness, if we were properly educated, and if the hospitals and clinicians better communicated with each other, would a second episode have been averted? I don’t know,” Bobbie said. Roberta Reed is a Patient Partner working with SIDM’s Patients Improving Research in Diagnosis (PAIRED) project, funded by the Patient-Centered Outcomes Research Institute (PCORI). Read her biography. To learn more about the project, contact Sue Sheridan at sue.sheridan@improvediagnosis.org.